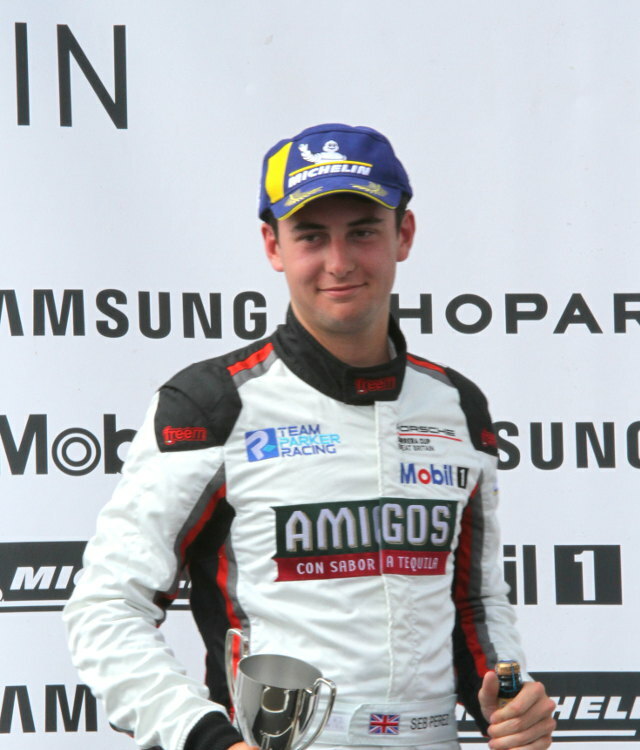 Chesterfield’s Amigos Team Parker racing ace Seb Perez returned to race track action last weekend after the Summer break in the Porsche Carrera Cup GB Championship at Snetterton in Norfolk (28/29 July). 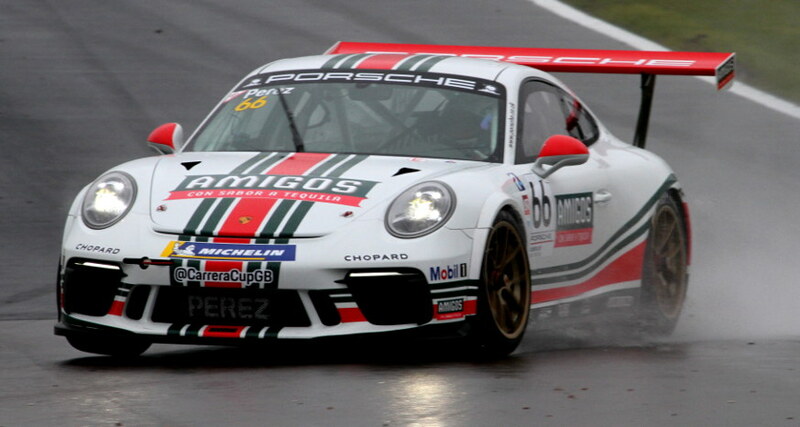 The 18 year old racer stormed to a Porsche ProAm double podium success over the weekend meaning to carry on where he left off at Oulton Park at the beginning of June. Six weeks ago he travelled to Cheshire circuit with an impressive victory in race one in the Pro Am title, his third win of the season was complemented by yet another podium spot in race two, taking third place after an intense battle for the lead, meaning he left the Oulton Park just seven points shy of the championship lead. He arrived at Snetterton to take the fastest ProAm time on Friday’s Free Practice session and battling through two tricky races on Sunday to score second place in both, ensuring the ProAm title is firmly within reach with just six races remaining this season. A frantic Free Practice session in searing heat at the Norfolk track saw both Perez and his Nottinghamshire Team mate George Gamble on form from the very start with Gamble third quickest and Perez taking second fastest ProAm. Perez would pip Gamble in the second session of the day and take quickest ProAm in the process but neither Team Amigos driver could convert that to grid positions in qualifying on Saturday after having a struggling session. Gamble would start the opening race on Sunday morning in fifth with Perez down in 11th and fifth ProAm. Fantastic work and Set up changes by the Team Parker Racing outfit overnight on Perez’s Porsche would address balance issues and a much cooler track, coupled with damp conditions and a late change onto wet tyres inspiring both drivers to push for the race one. Snetterton’s three-mile-long circuit saw spins galore across the tightly weaved pack of 23 cars and Perez was aimiing high after his low start on the grid. By the opening lap, he had moved into third ProAm driver and one of the closest battles of the race ensued. After making his way to second, a lunge passed Jamie Orton saw Perez take the lead and a thrilling duel to the flag began, with Perez only losing out on the final lap to take second by 0.199sec. Drier conditions for race two saw battles just as close across the pack as they were in the race one, Perez and Orton picked up where they left off in the first outing and a nose to tail battle over the 14 laps resumed. Gamble would repeat his race one form to take sixth leaving Perez to look for another podium and that’s what he did, his second podium of the weekend, bagging essential points for both his ProAm and Rookie campaign. “I’m really happy with the weekend,” said Perez on the final podium of the day. He added: “It’s been a really close run thing in the ProAm category throughout the day so in terms of points, we have ensured that we’ve come away with a healthy haul. I really enjoy the close racing like today and I think if we had a few more laps we could have taken Jamie (Orton) in race two so it shows the pace is where it needs to be. I’m certainly aiming for one step higher on the podium at Knockhill though”. Amigos Team Parker Racing retains its second place in the Team Championship as the season heads North in just under a months time at the Knockhill Racing Circuit near Dunfermline for rounds 11 and 12.